Cherry Gloss Gold Lip Stamp Seal Black Matting Twin Opening Panorama Frame. Relive your school memories with this nostalgic campus scene image. It‘s the perfect complement for your diploma! Presented in a high gloss cherry finish with fine gold accents inlaid into the frame. 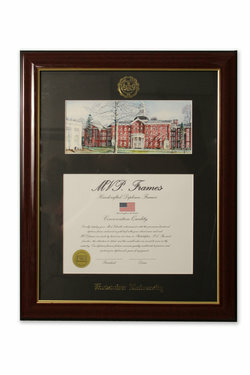 Conservation quality black matting complements the school seal and school name embossed in gold. Outer Frame Size: 18" x 22"
We we're very pleased with the quality of this frame. My graduate really loved the picture of Old Main!! The turn around time was excellent!! Thank you!